I hate having to pull myself away from my warm bed (and possibly that special someone…) to face the cold air. I hate changing out of my cozy flannel pants and hoodie to put on work clothes. So it goes without saying that pulling my half awake brain together to get myself breakfast never happens. Ever. Especially since I am chronically running 15 minutes late because I hit snoozed/cuddled in bed/picked out clothes for too long. but… i LOVE this recipe. I make it the night before. It comes together in 5 minutes and it makes 2-3 batches which means I don’t have to think about breakfast for 2-3 days. It’s convinent. It’s portable. It’s yummy. It’s my new obsession. 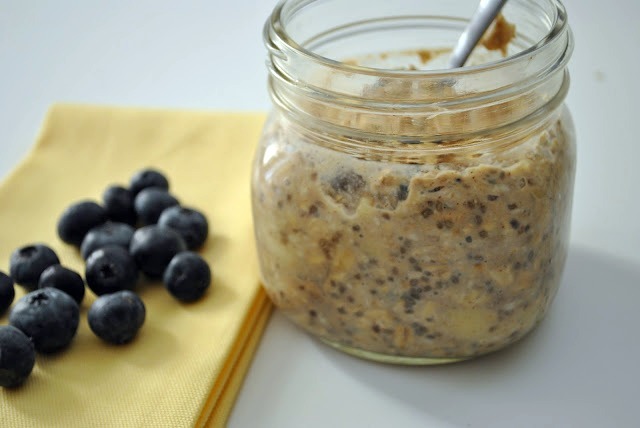 Expect a new overnight oats recipe every week in a different flavor. Because I LOVE this recipe. Directions: Mix all the ingredients, except granola, in a small bowl. 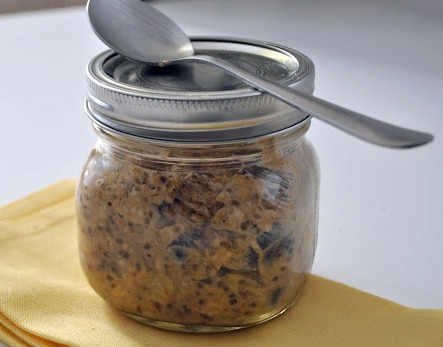 Divide into 2 or 3 small containers (I used glass mason jars) and place in fridge overnight. In the morning, give it a stir and enjoy cold with a sprinkle of granola on top. Keeps in the fridge for 2-3 days. *The chia seeds can be found in the health food section of most grocery stores and definitely at Whole Foods. 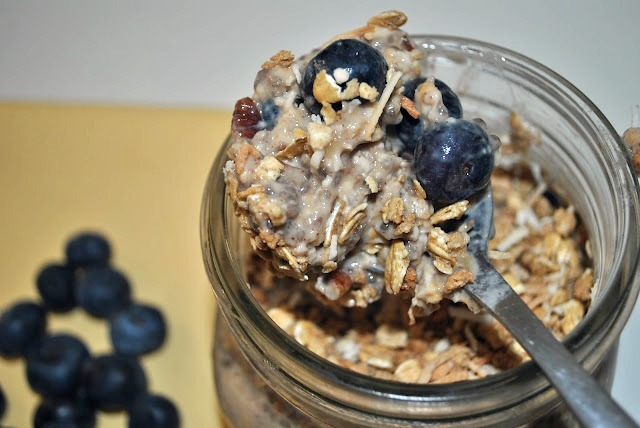 They are really essential to the thickening process so without them, you will most likely end up with oats and blueberries floating in milk. Not so tasty. Or, you can get the online. What did people do without the internet?? Though be warned, depending on what kind you buy, they look a little more expensive on line then in the store. One package will last you awhile though. Also, I used mason jars because 1. I had them around and 2. They have a lid and I can throw them in my bag without having to do a thing with them in the morning. Less work = more snuggling time= a less grouchy Erin in the morning. And that should make everyone a little happier. By the way, Oatmeal is really hard to photograph. And also…Happy Friday the 13th! I’ve been doing a very simple version of this myself lately, but I microwave for 30 seconds in the am cause I like it hot. And I used ground flax seeds instead of chia. Yum! !